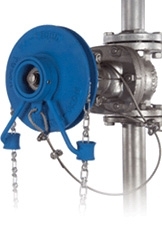 The Roto Wheel combines two critical components for safe and dependable suspended valve operation: our Roto Hammer Chainwheel complete with the addition of a fitted, factory installed retaining cable safety kit (RCK). Simplify the ordering and installation process by purchasing a Roto Wheel (which combines our Chainwheels with the popular RCK safety kits) or buy the Chainwheel and RCK separately and install in the field. The Roto Wheel is available in all Roto Hammer Chainwheel Models (C, CL, E, and M Series).